Home - Is there a killer lurking at the wheel? This coming Songkran holiday will be no different. 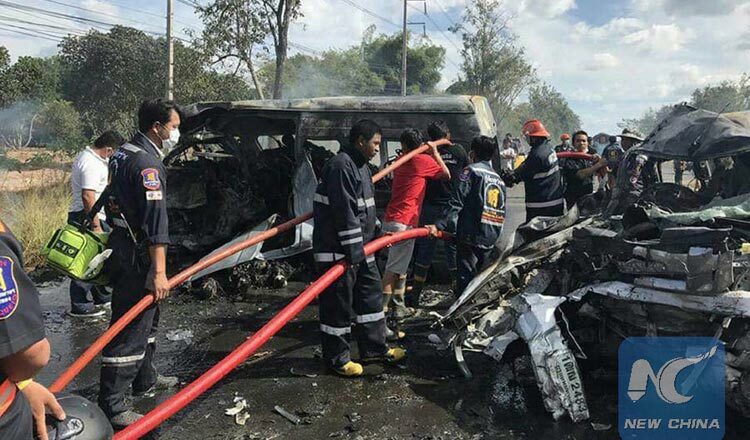 Several measures to cope with road carnage have been floated and the most controversial idea comes from Deputy Prime Minister Prawit Wongsuwon. He has ordered police to charge speeding and drunk motorists who cause fatal accidents during the Songkran holiday with premeditated murder. Gen Prawit insisted such a harsh punishment would add to other measures adopted previously to boost road safety during Songkran such as the impounding drunk drivers’ vehicles. It is unclear whether Gen Prawit’s proposal is legally justified by the standards of any book of law. Without a doubt, Thailand needs stricter law enforcement to curb drink driving. But charging drunk drivers who caused fatal accidents with premeditated murderer is not the right call. Premeditated murder is a crime for a killing that was planned in advance and was carried out wilfully. In layman’s terms, it is about one’s intention to kill others. How many people who drink and drive intended to kill others? When it comes to enforcing the criminal law, motive and intent are the critical factors to be considered. No exemptions should be made from the spirit of the criminal law just to solve one problem. And if speeding and drink driving during Songkran is treated as premeditated murder, why isn’t falling asleep at the wheel or drowsy driving in the event it causes deaths? Studies say such behaviour creates as high a risk of fatal accidents as drink driving. In fact, Thailand does not need such harsh punishment but more effective and indiscriminate law enforcement. There are laws that curb and punish speeding and drink driving, and that force the use of helmets and safety belts. Authorities just need to enforce them more effectively without letting offenders off the hook too easily. Any officials failing to enforce the laws should be subject to disciplinary or legal action. The ways in which authorities have handled some high-profile road accident cases have made the public doubt their standards of law enforcement. For example, Red Bull scion Vorayuth Yoovidhya in 2012 drove his Ferrari into the rear of a motorcycle ridden by a traffic policeman in Bangkok. The officer’s body was dragged underneath the car for about 200 metres and he was killed. Mr Vorayuth was found drunk later but he claimed he drank at home after the accident, not during the driving. Prosecutors decided not to charge him on drink driving but only reckless driving causing death and failing to stop and help a crash victim. On the contrary, former senior public health official Yorn Chiranakhon was charged with drink driving and attempted murder for running his car into a security guard and dragging him under the car for 20m. Before treating speeding and drinking during Songkran as premeditated murder, the government should ensure that authorities apply existing laws and regulations effectively. More severe punishment for traffic violators, if needed, must undergo public consultation and amendments to relevant laws in parliament, and it should not include defining speeding and drink driving as premeditated murder.